The best jackets for trekking will keep you warm and cozy if you are out for a trekking expedition. Trekking is an adventurous outdoor activity which involves traveling through forests, mountains or a variety of terrains on foot and so it attracts a traveler. The outdoor sport requires proper planning where you need to carry appropriate trekking gear, including the best trekking jacket, and undertake specific training. Before you start your trekking expedition, make sure you acquire trekking essentials like a waterproof backpack, a trekking jacket, trekking footwear, a Compass or GPS navigation device. Here in this section, you will discover the names of wallet-friendly hiking jackets in India. All the jackets named here are outstanding whereby some are eye-catching while others too warm, durable and of dependable nature. Some are simple but priced leniently while others are elegant. Trekking gear can make a huge difference to how you feel throughout the expedition. It is mandatory to have discerning eyes while choosing the best trekking jackets. When compared to other winter gear, a trekking jacket is supposed to offer more features to enjoy. A down jacket is the best insulator known to man. If you are into hiking, this section will acquaint you with the names of best jackets for trekking regarding designs, material, making, weight and warmth. In all respect, a down jacket is warm, lightweight and packs in several features. A trekking jacket should be fully featured to stand out from the rest. It should be durable, constituted of high-quality materials, provide sufficient warming and feature top-rated metal. This year we have many companies coming up with their collection of best-hiking jackets. Besides having such features like durability, superior warmth, using top grade materials, they look good to add to the value proposition. You should buy a jacket as per your needs. Down is that insulating layer which keeps the bodies of ducks and geese warm and cozy. A down jacket, as the name suggests, uses this insulating layer. The insulating layer has millions of minute air pockets that help to warm the air from one’s own body. The warm air is then held around, and the more inert the air, the warmer you feel. Down has the finest warmth to weight ratio, and this is why down jackets are the best. Down retains its loft pretty better than synthetic insulation. When buying hiking jackets in India, you need to think whether you want synthetic insulation or down insulation. Although down is warmer, it can’t retain its loft when wet. When there is a heavy downpour, and you are out, Down loses insulating property and becomes a heavy heap of the feather. Modern synthetic retains its loftiness even when it is wet. A synthetic jacket is warm, lofts up only when it is new. But, down has a high fill power, and so it bears a great insulating property. It lasts much longer than synthetic and maintains its warmth and loft. But then, a synthetic jacket is far more durable regarding abrasion. A down garment costs more money than a synthetic counterpart. So, while the down jacket has the best warmth to weight ratio, it is pricier and also loses its loft when the conditions are wet. Synthetic counterpart continues to warm even when there is a heavy downpour, does not leak even when the jacket tears, but then it is not durable like down. Synthetic down does not compress easily like usual down. As already stated, regular down turns into a heap of the feather when there is a heavy downpour; you may look for a waterproof hydrophobic down. Hydrophobic down is that down jacket which has DWR coating to repel water. Hydrophobic down retains its loft much better. DWR coating prevents water from getting soaked by the down. You must look for hydrophobic down jacket. This part may seems to you little technical. 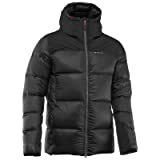 The fill power of trekking down jacket refers to the quality or the grade of down insulation. Generally, the manufacturers of down jacket advertise the fill power as 650, 700, 800, 850. The numbers refer to cubic inches the down occupies. If the fill power is 800, one ounce of down occupies 800 cubic inches. You should look for more and more fill power. The fill power of down or the numbering is important as it helps to find how warm the jacket is. Look for certified down which means that down, the insulating layer, was not harvested from abandoned duck nest. Certified down also suggests that the animal was treated before relinquishing the down for jacket. What kind of construction it has? When it comes to the construction method, it may be either welded baffle or sewn-through. The sewn-through method is used commonly for it consumes less time and is much cheaper than baffle construction. In the sewn-through technique, the outer layer is stitched into interior lining directly to separate the down into different baffles. The process of sewing is simpler than box baffle construction as it uses less of fabric and so the jacket is also lighter. Sewn-through is a popular construction method for its simplicity and for the fact it makes a lighter jacket. The fabric of the jacket determines the level of warmth you get and the performance of the jacket. While buying a jacket, it is important to consider gender. Trekking jacket men compromise on aesthetics and are simpler. They come with plenty of storage options and features. Trekking jackets ladies are more fashionable and lack useful features. Made for mountain trekking for multiple days in cold weather. Face the extreme cold with this down jacket featuring down and feathers. The most warmest in our range! Folds away in its storage bag to be stuffed at the bottom of the bag. The Quechua Trekking Down Jacket is perfect for mountain-trekking enthusiast and may be worn for several days continuously. Weighing around 550grams, this trekking down jacket has 15% of feather filling and 85% down. It folds away easily and can be conveniently stuffed in a backpack. Thermobonded main seam stops feather from accumulating or getting through. The shoulders have stronger inserts while the wrists feature immense durability. The lab-tested down jacket is a fabulous body-warmer and you can go for it. Thermal insulation : Down filling around torso and back: 75% down / 25% feather. Hood. Long back. Easy storage : 2 zipped hand pockets. This down jacket offers a lot of advantages and is classed as one of the best jackets for trekking. Men’s down jacket by Quechua features thermal insulation, down filling at the back and torso. It uses 75% down and 25% feather, having a long back and hood. It comes with a storage pouch for convenient storage. Feather proof fabric facilitates long lasting warmth. It is easy to care for and maintain. Shell: Shadow Ripstop 100% nylon. Lining: 100% polyester taffeta. Insulation: synthetic down 100% polyester. Are you in hunt for a complete waterproof trekking jacket men? Columbia Men’s down Jacket is a unique kind of jacket since it is fully featured water-proof jacket and is priced affordably. Even when there is a heavy downpour, you can stay dry. The down stays dry and continues to trap heat from your body. But, it may not give you sufficient warmth and so the jacket is not suitable for extremely cold places. So, the lightweight down jacket can keep you warm in your path to adventure. Want to buy a jacket for mountain trekking? Trek 100 Men’s Trekking Down Jacket is perfect when cold weather lasts for a few days. The eco-designed down jacket is constituted of polyamide woven fabric for durability and its polyester wadding keeps the user warm. The raw material is 50% recycled and the design is compact. The surface of the down jacket is water-repellent. This is a certified comfort jacket providing warmth even when the temperature moves below -6 degrees Celsius. Trekking jackets ladies are fashionable and feature superior aesthetics. This particular down jacket is best for mountain trekking and is designed in an eco-friendly manner. The features of this jacket are almost the same as no. 4. It is also eco-designed mountain trekking down jacket. The tried and tested women’s jacket is thin and provides warmth and comfort. It is lightweight, water repellant, durable and comes with 2-year warranty. The product is comprised of 50% recyclable material. This is fully featured, reasonably priced jacket for men. The down jacket has a fill power 800 CUIN and may easily be folded away. The ultra-light jacket weighs 290grams. The surface of the jacket is water-repellant to prevent any percolation of water. When you are out for trekking, you can’t take chances in anything. You got to have the best trekking gear. This down jacket is light, warm and easy-to-store. The jacket arrives with a storage pouch for easy storage. Again, it is surface treated to prevent any seepage of water. It features 2 hand pockets and one chest pocket. If you buy trekking jackets online, you may get attractive discounts. This jacket by Alpi Men’s is perfect for mountaineers, hikers and climbers. The ultra light jacket gives complete protection from the cold weather. The jacket is warm, compressible and comes with a hood. Its precise cuts allow freedom of movement. If the weather is extremely cold, then go for Top Warm Men’s Down Jacket. 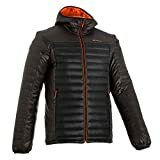 Among so many trekking jackets for men, Top Warm Men’s Down Jacket is one of the best jackets for trekking. The warmest of all jackets is extremely durable with strengthened panels for greater abrasion resistance in the cuffs and shoulders. The fill power is superb and comes around to 660 CUIN. You may stuff it in the pocket to save some space in the rucksack. Are you searching for a lightweight, compressible down jacket? Go for Makalu II Down Jacket. The warmest of jackets will save you from the biting cold even when the temperature moves below -29 degrees Celsius. So, you may make a suitable choice from the list of top 10 best jackets for trekking. Trekking jacket men are different from those of women. To complete your trekking expedition successfully, make sure you have all the essential gears.